Hello friends and readers, I am back. I took a hiatus. I needed to take a break. I pushed myself back into this project too quickly, and overwhelmed myself. I didn’t realize just how much work blogging can be. I’ll be honest with you guys. In August, I had to have a brain surgery. I had a brain tumor removed. I am fine. The tumor was benign. I spent one night in Mayo Clinic’s Neuro ICU and was discharged the next day. Suffice it to say, I healed well. But now that I am finally feeling like a human again, I’m really, actually living again. I started teaching a yoga class on Saturday mornings. Did I mention that I earned my RYT-200 this past summer? In October, I visited my best friend and saw a Paul McCartney concert. I also tried a circuit training class in 90 degree heat – hmmm! It was actually a fun experience! I took a week-long road trip with Brad and Logan and ate the best BBQ of my life in St Louis. We checked out zoos, museums, and aquariums, too. And now we’ve just finished up the holidays, and subsequently, the year 2017. Hallelujah. Tomorrow, in 2018, Logan also starts “school” – preschool. Which means we’ll be even busier. So, readers, I’m going to share more recipes, more experiences, more life with all of you! Which puzzles me. He doesn’t like a lot in them. Obviously we omit cheese and sour cream; occasionally we’ll add Daiya cheese if we have it. Otherwise it is ground beef or turkey with taco seasoning, refried beans, and guacamole. Maybe a side of salsa for dipping. And that is Logan’s taco. So I really thought he’d love this baked chicken flauta recipe. I even resorted to calling it a taco. No dice. It was too crunchy for him. However, Brad and I thought they were great, so I think the recipe is worth sharing! Prepare the chicken. I used a crock pot – place chicken breasts in crock pot with salsa on low for 6 hours, then shred chicken. Note: to make this step quicker, you could boil the chicken and shred, or use a rotisserie chicken. Preheat oven to 400 degrees. I used a 9 x 11 cake pan and covered it with tinfoil, then spread a little bit of olive oil on the tinfoil. Place chicken in a large bowl; you won’t need the extra sauce from the crock pot. This is where I added about half of the can of corn. I would have also loved to add black beans but didn’t have any. Assemble the flautas! I spread a tablespoon or so of refried beans on each tortilla, then spooned a couple tablespoons of the chicken and corn mixture on top. If you want cheese, add the cheese on top of the chicken. Roll up, then place enchilada-style in the cake pan. Once all flautas are prepared, brush olive oil on top of the flautas. This is key in getting them crispy. Bake for 15-20 minutes. Voila! Serve with salsa and guacamole. Here’s the chicken and corn mixture. We did 1 cup of a homemade salsa and 1 cup of a peach and pineapple salsa. Yum yum. The best tortillas in the world. I prefer these because they are hearty – they don’t break under the pressure of the wrapping of the flautas. Oh, and they’re good for you – bonus. The flautas before they went in the oven. The only picture I remembered to take after; Logan’s flautas with a scoop of guacamole. He just ate the guacamole. And there you have it, friends! I hope you like these better than Logan did! Note: these post was sponsored by Food For Life. Although the product was provided to us, the opinions are entirely my own. Hello friends… I have noticeably been on a hiatus. To be honest, we haven’t tried any new recipes lately. I haven’t felt compelled to write but I’ve also been recovering from a major surgery. But…. it’s 5 weeks post-surgery. I am healing beautifully. And I’ve got stuff to say. So this Saturday evening is a long overdue review of Enjoy Life’s new chewy bars! We were sent the chewy bars because we’re HUGE Enjoy Life fans – they’re free of the “top 8” and their products are awesome. And PS, their chocolate chips taste no different than Hershey’s. We got home one day and there was a big box on our porch. Logan helped me open it and inside were the chewy bars. He was pumped because he’s a big fan of the Cocoa Loco and Sunseed Crunch chewy bars. We received Caramel Blondie, Carrot Cake and Lemon Blueberry Poppy Seed. He asked for the Caramel Blondie first. Well… let’s just say he ate half and asked for a new bar. Meaning the Cocoa Loco bar in the cupboard. I finished the rest and thought it was good. The next day we tried the Lemon Blueberry Poppy Seed. I knew his reaction before he took a bit – heck no. He does not like anything with blueberries. I would like to say I enjoyed this bar, but I’m not a poppyseed fan – so it just wasn’t my cup of tea. The Carrot Cake was Logan’s favorite of the three bars. There are raisins, and he is a raisin guy. If you don’t like raisins, I suggest you pass on these bars. All in all, we enjoyed trying these bars but Logan didn’t get a new favorite – Cocoa Loco and Sunseed Crunch for the win! Post-surgery, walking was recommended. So, we’ve done a lot of easy hikes and discovered Logan looooves to hike. Up later this week (I promise!) a recipe for baked flautas using Enjoy Life tortillas. Logan is a huuuuge taco fan so he’s going to love these! As I’ve discussed before, we figured out at a very early age that Logan had a dairy allergy – maybe 18 months. This was self-diagnosed due to symptoms, of course, but was actually proven with a blood test just before his third birthday. The soy and peanut allergy. Now that Logan is about three and a half, he doesn’t remembers life with regular cheese and yogurt. He probably remembers Reese’s peanut butter cups, but we use substitutes and it really isn’t that bad. But then, you settle in. You find substitute foods, and recipes, and restaurants. And you breathe a sigh of relief. But there are challenges. Such as educating your child on their food allergies. We made the decision to educate Logan right away. 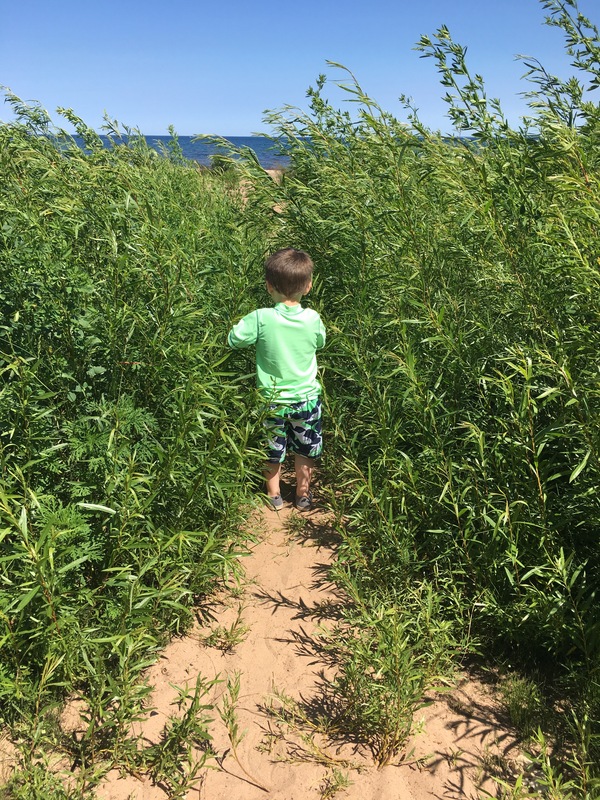 He is three and while we hope that this is something he grows out of some day, he may not – and if he doesn’t, well, I want him to know and understand the foods he can and cannot eat, and why. Which foods will keep him healthy, and which foods will make him sick. Granted, right now he doesn’t know food groups, so differentiating cheese from an apple, except by sight, is difficult. He can visually state that an apple is an apple. He can state that cheese is cheese. But can he state that cheese is dairy, and dairy is something he is allergic to? So, for example, we made the English muffin pizzas. His pizza had Daiya mozzarella style shreds, while Brad and mine had cheddar and mozzarella cheese. The pizzas look similar. We discussed that his cheese tastes similar, but it won’t make him sick. Later on, he told me that my pizza would make him sick, whereas his pizza would not make him sick. Right now, it is easy. We’re teaching him concretely that certain foods are “good” for him, and certain foods are “bad” for him, which is something I hate to do because I hate labeling foods as “good” and “bad” – but in certain situations, I guess there really is “good” and “bad”. Eventually, he will probably rebel and choose to eat foods that he is allergic to – and thankfully he is not anaphylactic to any foods. At that time, I’ll probably need advice for how to handle that! You may have noticed by now… we have a serious sweet tooth in our house. And while I try hard to get Logan to eat fruits and vegetables, my goal also is to modify his favorite foods. And my favorite foods. Logan loves chocolate chip cookies. And I love peanut butter cookies. And when they meet, it is heavenly. Most of the recipes I&apos;ve posted are my own creation. Today&apos;s recipe is a modification of Wallflour Girl&apos;s Peanut Butter Chocolate Chip Cookies. Although I cook and bake a lot, I am still a fledgling baker and couldn&apos;t come up with this caliber of a recipe on my own – so, I made modifications to suit our purposes. The original recipe is a winner. And so is this one. This recipe is sponsored courtesy of Sunbutter; they sent me several jars of their lovely sunflower seed butters to use for recipes (and to eat, of course!) For this recipe, we used the Creamy version, but I&apos;d bet that the Crunchy would be awesome too. In a large bowl or Kitchenaid stand mixer, cream together egg, brown sugar, Sunbutter, butter and vanilla. I mixed these ingredients for a full 5 minutes until they were super creamy. Add in baking soda, flour, and salt until fully combined. Cover bowl and refrigerate for 1-2 hours before baking. Preheat oven to 350 degrees; grease cookie sheets then use ice cream scoop to place cookies on cookie sheets, about 2 inches apart. Cookies should be taller than they are wide. Bake for 8-10 minutes; centers of cookies will look underdone. Let sit on cookie sheet for an additional 10 minutes. Before refrigerating the dough, you&apos;ll want to sample it. Yes, I&apos;ll caution against it. It has raw egg. I may or may not have sampled it. It may or may not be awesome. On the cookie sheet, they should look like this. Nice, rounded balls of cookie dough deliciousness. And when they&apos;re done… Sunbutter Chocolate Chip Cookies!! Hi friends! I realize I have been noticeably absent – I had surgery about a week ago and it will take me four to six weeks until I am back to full capacity. However, I am home and resting and will plan to post at least once per week, hopefully twice – especially since I’ve got some good things coming my way. We also have Chewy Bars coming in the mail to us from Enjoy Life and Logan is a big, big fan of granola bars, so watch for his review of those! A reminder that Enjoy Life is free of all “top 8” allergens, so while Logan is dairy-free, soy-free, and peanut-free, these bars are awesome for kids (and adults!) with the top 8 allergens. I also have a post coming about teaching Logan about his allergies – a tough thing to do as a parent, but a necessity. 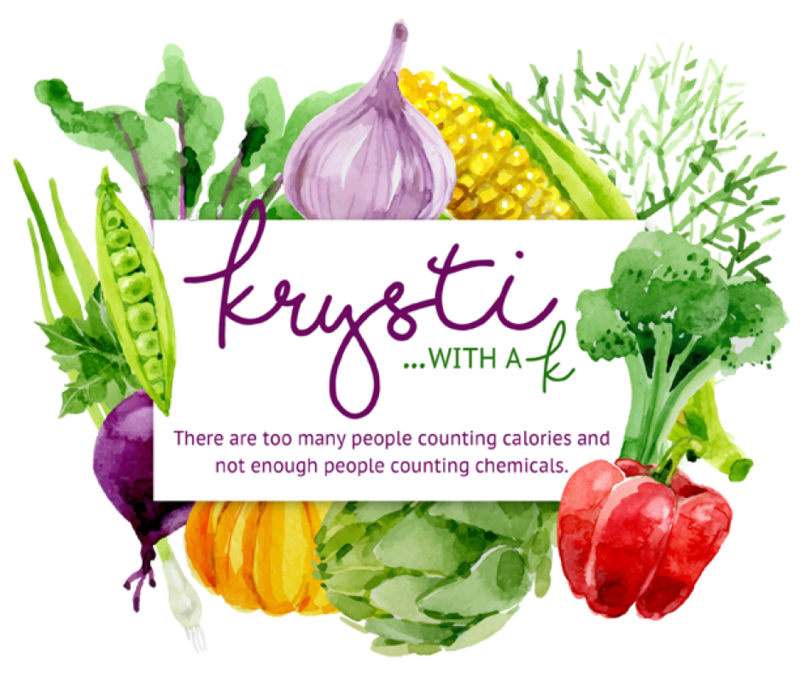 I just wanted to post a quick update so that you didn’t think I forgot about things – follow my Instagram and FB pages ( https://www.facebook.com/krystiwithak/) and let me know if there’s anything else you’d like to see! If you haven&apos;t figured it out by now, at our house, we love pizza. And I love English muffins. We actually have designated Thursday&apos;s as Pizza Night. Friday is Pizza Day at Logan&apos;s daycare so this way, I can send pizza that is dairy and soy-free. If I&apos;ve got time, I make homemade crust. Store bought crusts have soy (well, most that I have locally) so I found a favorite recipe from Allrecipes. Yes, it&apos;s time-consuming but the pizza is restaurant quality. This is the recipe I use here. But in a time crunch, I&apos;ll use tortillas or English muffins. So, the folks at Enjoy Life kindly sent us the the supplies needed to make these lovely little pizzas. I&apos;ve always been a big fan of their bread products because I love sprouted grains. Why? Because sprouted grains taste better. They may be less allergenic than other grains. They fight fatty liver disease. They taste better (this is a biased opinion, of course). I started Logan on sprouted grains as soon as we introduced bread products. He doesn&apos;t know any different – the only time he gets other options is at restaurants. Preheat oven to 350 degrees; each muffin (both sides) serves 1 – make as many servings as desired. Spray cookie sheet with cooking spray. You can probably omit this step, but I like to do it because I think that the cheese cleans up easier. Split English muffins in to halves and top with pizza sauce. Top with toppings of choice. If you&apos;ve got soy allergy in your household, watch the pizza sauces carefully – lots of pizza sauces are chock-full of soy. Top with cheese of choice. Brad and I use both cheddar and mozzarella cheese. For Logan, we either omit the cheese completely, or we&apos;ll use Daiya mozzarella style shreds. A note about the Daiya – it does melt, but it does not melt as quickly as "real" cheese. Finally, the finishing touch – sprinkle with Italian seasoning. It is not necessary, but it gives that extra something. Cook for 10 minutes – the cheese will be starting to melt. You can choose to cook for an additional 3-4 minutes, but this is the time where I turn on the broiler and broil the pizzas for 2-3 minutes. The cheeses start to brown and the English muffin gets a bit crunchy. Voila! Your pizzas are complete! Enjoy! In the photo above, the pizza in the front is Logan&apos;s, with the Daiya cheese. Note that it does melt, but it doesn&apos;t quite get as melty as real cheese. Don&apos;t let it deter you. It is still delicious. These English muffins are the best for little pizzas; they&apos;re substantial and delicious. If I&apos;m cooking with English muffins, I don&apos;t like to use "wimpy" English muffins – they don&apos;t hold up as well. It will be the same with pizza, especially if you pile it with toppings. The heartier the muffin, the better the pizza! As a three-year old, Logan obviously has highly refined tastes and these English muffin pizzas definitely fit the bill! From my posts, I know you can glean that I&apos;ve been a long-time migraine sufferer. Today, I thought I&apos;d share my story with you. I&apos;m 31 years old and I&apos;ve been getting migraines since I was 12 years old – about two-thirds of my life. That&apos;s crazy to me that I&apos;ve been dealing with this chronic issue for that long. I can actually remember my very first migraine; I was at my best friends house (although at the time, we were just kind of new friends. It was pretty obvious that I was hurting though, so her mom called my mom (embarrassing, right?) and I was given water, Tylenol and a nap. I woke up feeling fine and the sleepover carried on. But the headaches continued. The pediatrician didn&apos;t quite know what to do with me, so I was sent to a pediatric neurologist, a lovely doctor who didn&apos;t want to start me on medications right away. However, it wasn&apos;t long before I was missing school for headaches and I was popping pills before school in the morning. Around the age of 15 or 16, the neurologist wanted to send me to University of Michigan&apos;s Headache Clinic, which was renowned for their work with kids. I refused. Luckily, around that time, my headaches got better. And then, for a few years, I just felt better. Migraines, cured. It was like – discussion of an inpatient program and that was it! I was a new person! Enter college, where I was paying rent for an apartment with my two best friends, a cell phone bill, car insurance, and gas for said car. And doing this by working as a cocktail waitress, working until bar close. Oh, and don&apos;t forget – living the waitress lifestyle by drinking whatever cash was left over. Let&apos;s just say that I got through college with a degree, little money, chronic daily migraines, and a whole lot of great memories. Enter professional life. As a nurse, my first job was working night shift. Add to that going back to school… oh and did I mention, I was still working as a waitress? I switched my shifts to day shift – cocktail waitress by day, nurse by night, student somewhere along the seams. Suffice it to say, something had to give. It was my health. My health was awful and my migraines weren&apos;t much better. I switched to a day shift job – and things improved. My headaches were better for several years! Then I got pregnant – and they&apos;ve been ebbing and flowing ever since. Logan is 3 and when I look back at the past 20+ years of my migraine life, I&apos;ve been on at least a dozen medications, have taken enough pain pills and anti-anxiety pills to tranquilizer a rhinoceros, and I&apos;ve spent a fortune on alternative therapies. So…. what&apos;s working for me these days? Good question. Currently, my headaches are sporadic. I&apos;ve been taking Topamax on and off for several years and it seems to work. I&apos;ve got a slew of abortive medications at my disposal, just in case. However, I live in fear of the rebound headache, so my headache must be severe to pop a pill. I&apos;m treating my migraines from a holistic approach (aside from the Topamax). I take magnesium and vitamin D daily. I use Bach Rescue Remedy when I&apos;m feeling stressed (yes, I&apos;m fully aware that this may have a placebo effect) because my migraines are often related to stress. I also carry around peppermint oil – and I am known to smell like a candy cane. I also try to get a massage with craniosacral therapy monthly. It is pricy but it is worth every penny. As I&apos;ve stated before, I also have a weekly coffee date with my therapist (haha). Currently, I&apos;m going through some health issues. I fully expected my migraines to flare up. Shockingly, since I&apos;ve made these changes in my migraine management, my migraines have been under fairly good control. Of course, this isn&apos;t to say I don&apos;t get a migraine that sends me to bed. In fact, last week I was in bed at 730pm on a beautiful night, ice pack to my skull and a myriad of meds swimming through my veins. But I&apos;ve found a way to live that works a lot of the time, although I do have some work to do in managing my stress. I encourage you to find what works best for you – whether it be medications or alternative therapies, or a combination of the two. If you&apos;ve found a way to manage your migraines, what&apos;s working for you? Logan and I are breakfast people. We will eat pancakes, waffles, and French toast for all 3 meals. In fact, our go-to, quick dinner is French toast. This recipe is not necessarily “quick” but it is easy. Prepare it the night before for breakfast, or in the morning for dinner – then all you’ve got to do is pop it in the oven. I used to make this recipe verbatim from Frugal Foodie Mama but had to make some modifications when Logan was diagnosed with food allergies. Along the way, I’ve also made some other changes. Today I prepared it in the morning so that we could have it ready after the afternoon’s activities – the beach. We had such a mild winter, I was sure we’d have a great beach summer. Not so much. It’s mid-July. Today is Logan’s first beach day. 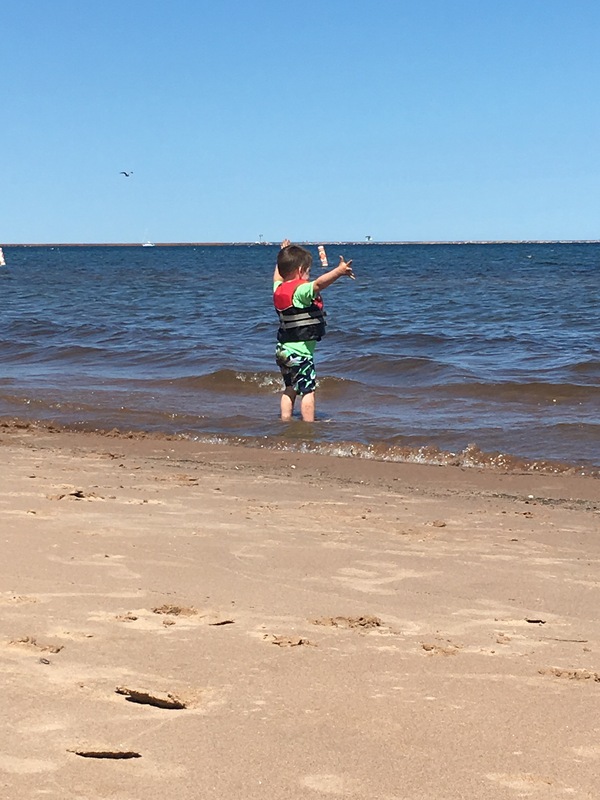 And have I mentioned Logan loves the water? 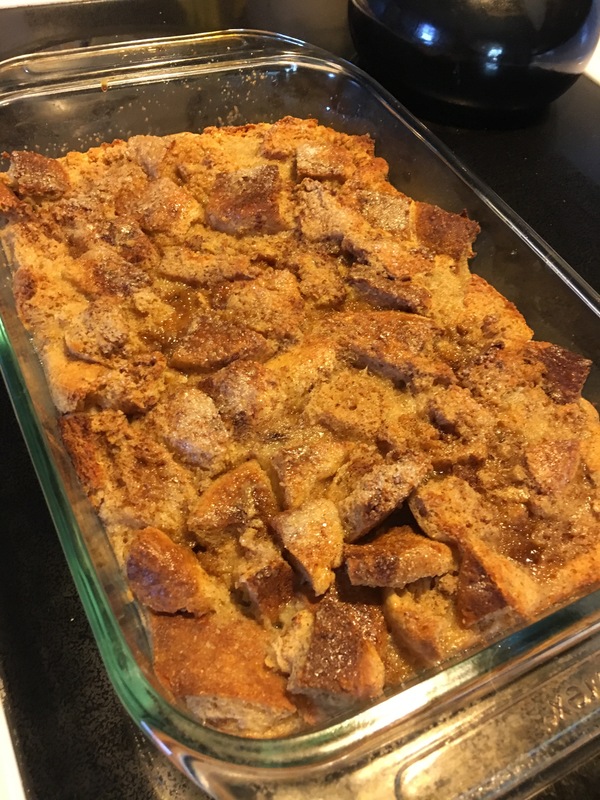 And this lovely English muffin French toast bake was waiting at home for us, simply waiting to pop in the oven, while we enjoyed Lake Superior. Spray or butter a 9 x 11 pan. Dice English muffins and place into pan. In a medium bowl, mix eggs, coconut milk, brown sugar and vanilla. Pour over English muffins. Ensure all English muffins have egg coating on them. Sprinkle with cinnamon. Cover and let sit over night or for several hours. When ready to bake, preheat to 350. 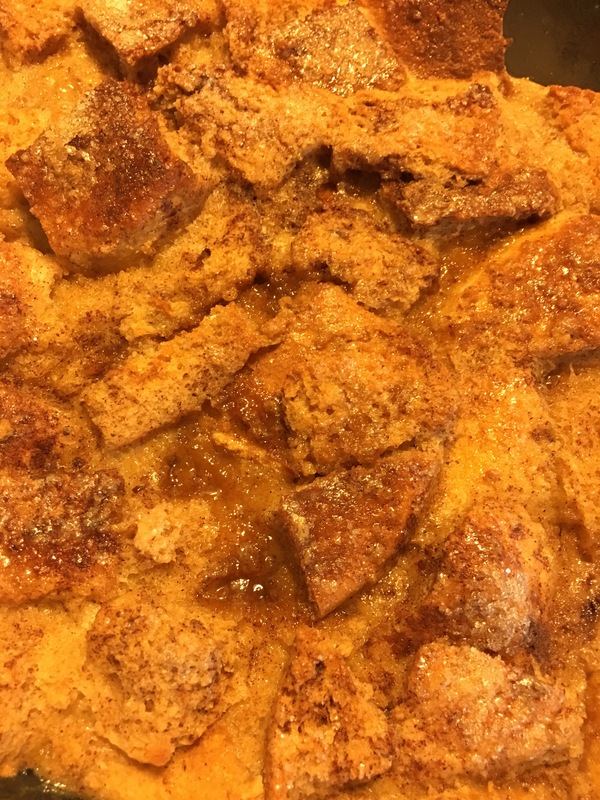 To prepare topping, melt butter, then mix brown sugar and cinnamon. Pour over English muffins and spread with knife or spatula if needed. Finally – sprinkle sugar to taste on top of the bake. I like to use Sugar in the Raw or a similar sugar. Bake for 40-45 minutes. If desired, broil for 2 minutes for a caramelized topping. We top this traditionally with butter and maple syrup but I’m sure it would be great with jam and whipped cream, fresh fruit, or peanut butter and chocolate chips. 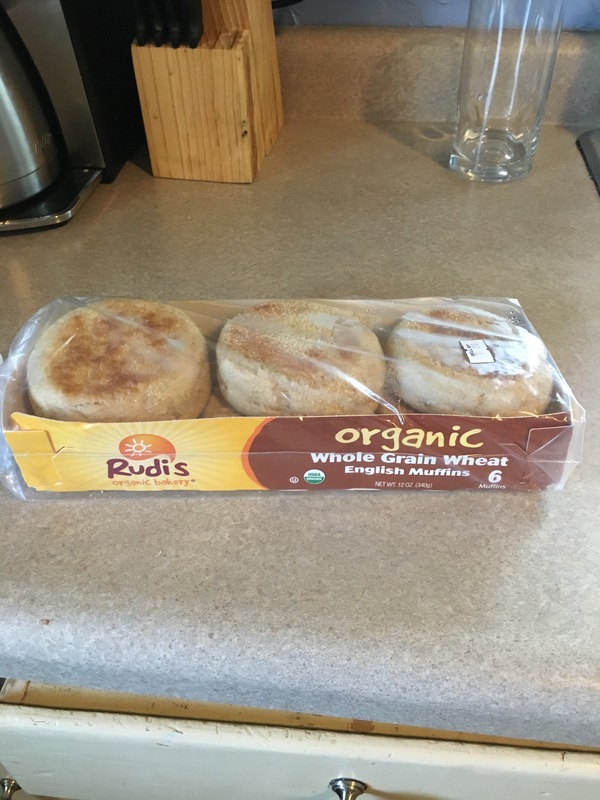 A tip for you all – don’t use “light” or otherwise “wimpy” English muffins – you may get a soggy bake. Today we used Rudi’s. It obviously doesn’t have to be organic but it should be substantial. And there you have it. This recipe will change your life. It’s that good.